The national football team determined the next warm-up opponent, Lippi is expected to personally end the nightmare five years ago! China Cup, the National Football Team's two consecutive fiasco, Chinese football once again cast a deep shadow. However, life must continue and Chinese football must continue to advance. After 1 to 4 lost to the Czech Republic, Lippi said at the post-match conference that in order to prepare for the Asian Cup, the next warm-up opponent would be some Asian teams. The national football training and warm-up have already had a general plan. In May of this year, the national football team will have a training session and two warm-up matches. According to the �Football News�, one of the two warm-up matches in mid-May was conducted in China and the opponent has not yet been confirmed, but another match played abroad is basically determined by the Thai team. The Thai team is a lingering �nightmare� for the National Football Team in recent years. In 2013, Camacho led the National Football Team to a humiliating loss of 1 to 5. In that game, the national football appearances were all old players who had been playing in the Super League for a long time. Sun Ke, Feng Zheng, Zheng Yu, Yu Lin, Qin Sheng, Zhao Xuri, Wu Lei, Wang Yongpo, Yu Hanchao, Yu Hai, Yu Dabao, Yang Asahi has played games. Thailand is not a national team in the true sense, but is a U23-based team. At that time, the Thai team ranked 142 in the world, which was even lower than the national team's ranking in the world, but it was such a Thai team. 5 to 1 defeated the national team, which was the worst defeat in the history of national football against Thailand. In May of this year, the national football team will once again face Thailand. It will be time to move. At that time, both sides will no longer have the same situation. Thailand is getting stronger. On March 22 this year, Camacho, who led the African giant Gabon, lost to Thailand 2 to 4. Thailand's current football atmosphere is very good. Thai football is even better than Chinese football. Thailand was indeed very weak in the past and only reached the final stage of the World Cup Asian qualifiers in 1997. But now Thailand has put "Football from the Doll" into action. Thailand's youth football training institutions have blossomed, and the echelon training of professional leagues has also entered the right track. There are more and more youth competitions represented by the Thai Youth League. U13, U15, U17, and U19 are very systematic. In 10 years, the Thai Football Super League has grown from 10 teams to 18 teams. Football has become one of the most popular sports in Thailand. 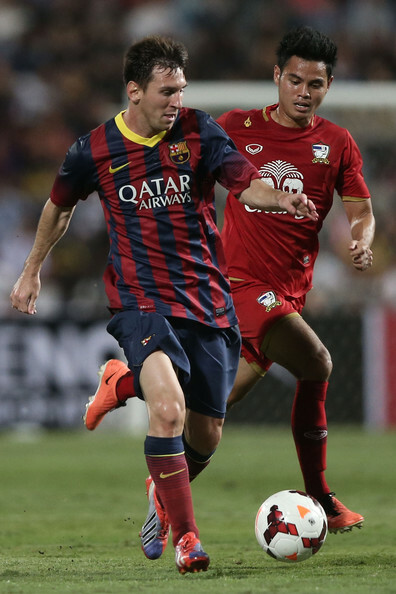 A game in the Thai Super League even created nearly 40,000 visitors to the audience. It was necessary to know that Thailand had a total population of 67 million. Thailand also beat Australia 5-1 in the U19 Southeast Asian Championship. After the Chinese Cup defeated, Lippi emphasized that the national football team will be replaced by new players. They will select young people to enter the national team. In the next game of the National Football Team, Lippi will be more determined in the national football team's policy of reusing young people. Wei Shihao, Liu Xiaoming, He Chao And other people will get the opportunity to play. Thailand�s match against Thailand in May is a very important test for the national football team. We can�t win Wales and the Czech Republic. The National Football Team can also say that it�s really not as good as anyone. However, in the face of Thailand, which belongs to Asia, the National Football Team must take its own strength and lose. It is really nothing to say. I hope the national football can be shameless. Now the national football coach Lippi has already started the preparations for the Asian Cup. According to the good multimedia report, the national football team's opponents in the warm-up match will also be finalized. Lippi will lead the national team to two warm-up matches with Thailand and Jordan. Its engagement between China Football Team and Thailand has attracted the attention of many Chinese fans. It is well known that the former national team led by Camacho lost 1 to 5 at home to the Thai team, which led directly to Camacho's class. This 1 to 5 game has so far hurt the hearts of football fans. At that time, when the national team chose the Thai team, they also thought that they could find a win feeling in Thailand who was as good as usual. Moreover, the visiting Thai team is a young Guards. The national football team at home to fight against the Thai youth team is still foolproof, so many football fans have begun to plan the national team to win the Thai youth team a few goals. In this situation, the Thai youth team gave the National Football Team a continuous blow in the second half. Five times through the gate guarded by Xiaofeng Xiao, the Thai youth team lifted China with a score of 5 to 1. It was only after the game that the fans and the media were indignant and emotionally stretched. The media will participate in the competition and Yulin encloses and interviews. Why does the National Football Team lose to the Thai Youth Team 1-5 at home? Yulin can't tell us how much we are. In addition to the game leading directly to the national football coach Camacho after class, but also ruined Xiao Xiaofeng and Zhao Peng's career livelihood. Due to the overwhelming success of the outside world and the fans� condemnation, both Xiaofeng Qiu and Zhao Peng�s careers began to decline. Now Xiaofeng Xiao is playing a replacement for Chinese Super League China National Football Team, while Zhao Peng is obsessed with making mistakes in the effectiveness of the China League. Therefore, many fans are very convinced, the national football team once again warm up to choose Thailand as an adversary. Will the national football team be able to win the game and give the fans a big victory? Is it still shameful to record and give salt to the football fans in the country? It is necessary to know the match and the fact that the game was actually played. As national football coach Lippi had to face this game highly. Don't repeat the tragedy of Camacho's school class because of a loss. During the interview with the media, Lippi has made it clear that the future Asian Cup will bring more young players to play. Therefore, the u23 teenagers who implied the best in these two seasons only need to be able to continuously demonstrate their excellence. Then Lippi's national team played in the Asian Cup rallies, there will be these young teenager figure. It can be sure that in the warm-up match and the Asian Cup, players will be collectively re-used after the 95th. Wei Shihao, He Chao, Patton, Gao Zhunyi, Liu Yuming, Huang Zichang, etc. are all standing players in the future of the national football's main frame. The newcomer's superiority means that the host will fade away from the national team. After a certain amount of 85 players, it is very likely that the players will bid farewell. In the selection of the Chinese Football Association, Feng Yi and Zheng Zhi were the most likely candidates for the new national team. Feng Yu, who was born in 86 years in particular, will play a role in the defense of the defensive belt in the defense. He will provide young teenagers like Gao Zhunyi and Liu Xiaoming with some experience and assistance. I hope Lippi National Football Team can bring us wonderful fans. อืม ผ่านไป5ปี จีนเองก็พัฒนาขึ้นเยอะ เราเองก็พัฒนาเช่นกัน ทุกอย่างวัดกันในสนาม วันที่2 เดือนหน้า รู้กัน!!! !